We are finding that our men enjoy a softness around the edges in the back for a professional appearance and not the “I just had a haircut look” they like coming in regularly every 3-4 weeks and some 2 weeks to keep their necks cleaned for business travel. We do provide a thorough consultation on their face shape, lifestyle and we need to know if you like to use product in your hair for high style or if you want to shake it out run your hands through your hair and run out the door. Either way we will discuss which of the cuts and styles will be best for you to work with .We will even train you on HOW to style your hair and even comb it in a better position for a more updated look. You will receive a shampoo first with the proper shampoo and conditioner customized for your scalp and hair type, secondly we will provide different techniques for the texture of your hair and how you want it to lay and move on your head. “A short story about a guy who, for the past five years, was never happy with his haircut.” Just about five years ago, my hairstylist who had been cutting my hair for about 8 years, retired and move back to Japan with her husband. After she moved away, pretty much, for five years, I was jumping around hairstylists to try and get that haircut that I was always happy with. That perfect cut. I tried close, far away, the Mall, even fancy signs. Always came home looking in the mirror, and complaining. After an immense amount of Googling, I ran across Kimberly. I made the appointment, and, a funny thing happened. When I returned home, I looked in the mirror, and was, pretty-much, speechless. The next day. Speechless. A week later, still speechless. After several appointments with Kimberly, I must acknowledge her Madskillz. Absolutely perfect haircuts every time. Almost unbelievable, to the point where my life has changed for the better. Wishing I had that perfect haircut is out of my life now. Thanks, Kimberly. Your skills are off-the-charts! We provide barbering, clipper cutting, razor cutting, shear over comb methods, thinning shears to make the fine ends blend like the show Suits. Professionals such as Dr’s, Attorney’s, Judges, accountants, financial planners, investment brokers, mechanics, truck drivers, and business professionals really enjoy our atmosphere. We provide natural nail manicures for men in a private area separate from the high traffic hair salon. Our manicures include a shaping and trimming of the nails, creating a shape, soak the nails, clean out under the free edge, discuss the treatments for the nails while you receive a massage on the hands and fingers to relax those stressed fingers. A high polish or matt is optional. natural nail pedicures are provided in the same private room in a Milano pedicure chair that is top of the line relaxing. Plenty of space and room on the seating, massage rollers will run up and down your back at any speed and give you some kneading on those sore muscles. You can customize the other settings on the chair as you wish. We will bring you a beverage while you relax. Indulge caters to the professional and the artistically creative man, who likes to be maintained and not look as if he “just had a haircut”. Our professional clients enjoy a clean, coiffed appearance that is polished and sophisticated. Our men do not like to wait for appointments. Our Indulge men either prefer a two- to four-week appointment schedule and like to get in and out on time. They prefer stylists who are expertly trained in barbering skills. Hair color is only used to camouflage and subdue those gray sparkles for natural looking results. Facial treatments are available for our men providing an intense extraction treatment to remove white heads (milia) and black heads (comedones) Feel free to talk with our specialist on the needs of your skin if you have concerns. Our facial treatments provide an opportunity of options for male grooming in gentle cleansing to extreme exfoliation peels. The consultation will determine which facial treatment will suit your skin needs best. 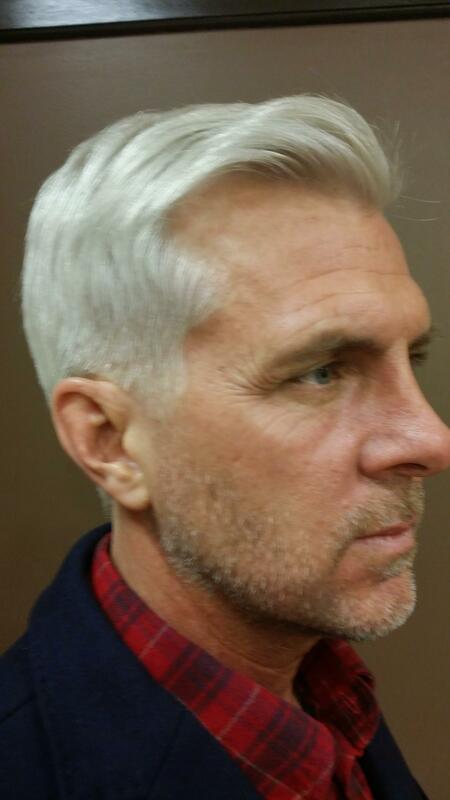 We also provide male hair color camoflage to blend in the pesky greys to make you look younger. Nobody wants to look like they just had their hair colored. Relax, we’ve got this! We will choose the appropriate color for your skin and the natural color that may be peaking through the white blends can make you look ten years younger with different techniques. We can use foil to separate out hair strands vs all over if you want to enjoy some of your natural white hair. At Indulge Salon, we have had huge success with these techniques that will camoflage the grey. The stylists are trained in the technique called balayage that allows us to “paint” the specific hair strands that were touched by the sun. Very effective and gradually washes out. This has been a male business professional’s favorite. Our creative customers are all about expressing their inner feelings and bringing them to the outside. They aren’t concerned about what others think because they see their hair as an opportunity for self-expression. They are attracted to our more creative stylists for cuts that are edgy and trendy, and color the hair to attract attention rather than blending in. They often like to “pop in” rather than make an appointment. Brow waxing is also done with in the salon environment, and you’re in and out in 5 to 10 minutes, tops. We first cleanse the area, powder to protect the skin, and then apply our moisturizing wax to remove unwanted hair between the brows. We also trim the brows for a clean look, without changing the original shape and thickness. Body waxing is done on a consultation basis, in a private setting.